What does it take for a worldwide consensus? Just 75 opinions. It’s true, 97%-of-experts agree the world is going to hell in a handcart. It’s part of the frontline toolkit used by the Big Scare Campaign. Do a google search on “97% of climate scientists agree” and 3,920,000 links turn up. In August 2010, the HockeySchtick site pointed out the 97% figure was just 75 self selected scientists. As as example of the way the chant is spun, the author, “MS” linked to the unSkepticalScience site and the screen image that John Cook posted in an article titled: “Visually depicting the disconnect between climate scientists, media and the public”. Don’t miss the fact that the graphic is subtitled “SCIENTIFIC EVIDENCE”. Presumably, the author, Matthew Glover, “thinks”, or wants the audience to think that this is what science is about. Opinions. Inclinations. Good guesses. Note the comical text at the bottom of the erstwhile army of casual-but-concerned greens. 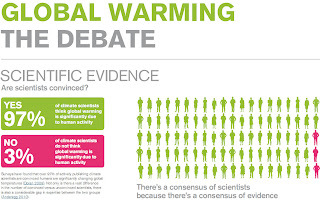 “There’s a consensus of scientists because there’s a consensus of evidence.” Admire just how much sloppy equivalence can be packed into one phrase: Firstly, the opinions of 75 climate-related scientists is implied to equal a consensus of all scientists; secondly, “there’s a consensus of evidence?” Since when does evidence form a consensus? Ponder an image of a room full of scientific papers nodding meaningfully at each other, or the local Professorial Fellow of Pseudo-psychology at East Quando College interviewing thermometers. Lately both Dennis Ambler at SPPI and Lawrence Solomon in The National Post (75 climate scientists think humans contribute to global warming) have picked up on the topic too. The number stems from a 2009 online survey of 10,257 earth scientists, conducted by two researchers at the University of Illinois. The survey results must have deeply disappointed the researchers – in the end, they chose to highlight the views of a subgroup of just 77 scientists, 75 of whom thought humans contributed to climate change. The ratio 75/77 produces the 97% figure that pundits now tout. The two researchers started by altogether excluding from their survey the thousands of scientists most likely to think that the Sun, or planetary movements, might have something to do with climate on Earth – out were the solar scientists, space scientists, cosmologists, physicists, meteorologists and astronomers. That left the 10,257 scientists in disciplines like geology, oceanography, paleontology, and geochemistry that were somehow deemed more worthy of being included in the consensus. The two researchers also decided that scientific accomplishment should not be a factor in who could answer – those surveyed were determined by their place of employment (an academic or a governmental institution). Neither was academic qualification a factor – about 1,000 of those surveyed did not have a PhD, some didn’t even have a master’s diploma. About 1 in 3 of the 10,000 odd Earth Scientists bothered to do the survey. Of them 82% answered yes to question 2. By dropping out anyone who published more than half their papers in any other field than strict “climate science” the 3000 odd replies was whittled down to just 77. Only 2 of those didn’t say “yes”, so the 97% figure was born: 75 out of 77. How many of those 75 depend on government grants that would be smaller or non-existent if there was no big fear of CO2 emissions? Who knows? And before anyone yells “ad hominem” at me for even asking, figure that we’re discussing a fallacy in the first place. Their opinions are just opinions, not evidence, and whether or not those opinions are influenced by money and fame is just another reason why we ought not hold opinions higher than empirical evidence. The results of the original study which was reported in January 2009, in a paper called “Examining the Scientific Consensus on Climate Change” by Peter Doran and Kendall Zimmerman which appears in EOS.